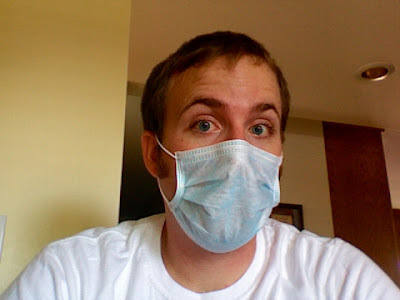 Surgical masks are used to prevent the transfer of disease, to promote general hygiene in a healthcare environment, and as fashion accessories in the streets of Southeast Asia. Taking the cue from our harder-working, lower-spending, and higher-saving friends across the (large) pond, I decided to try wearing one of those devices this week, and let me tell you, it has been transformational. I used to see footage of people in Hong Kong walking around with those masks, and wondered why they would bother with such unwieldy devices, but I wonder no longer. My surgical mask makes me look better. I have, in one fail, two-rubber-banded swoop, gone from a 7.1 to a 9.4. You see, it focuses the attention on the remaining visible portion of my face, my eyes, sideburns, and regal forehead, which happen to be my three best features, in order. Better than that, it hides the true size of my gigantic nose, and conveniently appears to reduce the size of my gigantic head, by, well, masking it. Lastly, it makes me look more like a doctor. If my experience watching House MD has taught me anything, chicks dig doctors, even if they're drug-addicted jerks1. I would highly recommend you purchase and wear one of these devices, and see what glorious miracles it can do in your personal life. 1. The doctors, that is. Though, I can only assume drug-addicted jerk chicks would still like doctors. So the statement stands either way. This post is meaningless without a picture. mr. findley, your comments are always incredibly helpful. behold, your pic.